I have been hopping around Blog land looking at all the different challenges we could all do. There are so many and this is just a short list that I have considered. I have decided to join Soscrappy`s Rainbow Scrap Challenge 2012. I really like this one for a couple of reasons. One, it has so few rules. She has picked the colour Red to work on for January and on Saturdays we have a linky thing to post what we have worked on for the week. We do not have to use just scraps but it is a good time to start in the colour scrap bins. This challenge has me sorting the boxes of scraps in the colours of the rainbow. I want to know what colour is next. I have a couple of projects in mind for this challenge. Watch for my posts on Saturdays for this one. Another one I will be keeping my eye on is over at Pleasant Home. The idea is to sew along on some of their projects. I will keep my eye open to see if there is something I really want to do. So far I have not started anything. But I think it is while worth a look. Another Mystery quilt I think I may want to do is Just Takes 2. Twice a month they give us patterns for some of the blocks that will be used in the quilt. It runs all year long. I have not started because I have not decided what two fabrics I will use. I have the first set of patterns printed off. Now what colours. Being a Canadian I do like the idea of Red and White. But I am not a big fan of Red. And White in my house with brown hairy dog is not a good mix. It would be a quilt I make and then hide away because it would show so much dirt. What ever I do, I will need to buy fabric (or Dye white I have). I have signed up to get my email notice of each pattern, this way I hope not to miss out on any patterns. Another challenge that I do not think I will do but wow many are doing it is Building Houses from Scrap. This is a Dutch site and has extended the registration till Jan 16, 2012 to take part, so just a few more days. The plan is to make a house block for each day of the year. That is 366 houses this year because it is a leap year. There are over 1300 following by mail and over 370 blog followers. That is going to be a lot of house blocks. She has started to post some photos of houses sent in by mail. She also has some hints on storing the block pieces. You should check it out. Maybe you want to make a small house quilt. 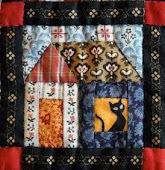 Over at Patchwork Times Judy is doing the Design Wall Monday`s. If you want to show a link to you blog and post what you have up on your wall ( or on the bed design wall). It is not really a challenge but I am planning to do many of these. I may miss a few but maybe if I could do 40 out of 52 weeks I will keep up with my blogging posts. Judy also does Stash reports and a UFO challenge. I do not think I want to know what fabric I use or buy. I also do not like the guilt of a UFO challenge ( I made a post about my lists earlier this month). I know it can keep many of you accountable to yourselves but I have to stay away from the guilt it may create for me. Let me know what you have thought of trying this year. What else is out there. I would love to hear from you. I am taking part in the Rainbow Scrap Challenge, Building Houses from Scrap, Friday Night Sew-In and I hope to work on Midget Blocks, Dear Jane and Just Takes Two. I can't remember what else at the moment!